It’s pretty obvious that hand washing is important in contact lens hygiene. However, in a study on lens compliance, 55% of contact lens wearers admitted to not washing hands when handling contact lenses (1). Tap water is not germ-free. 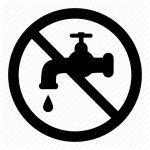 There are many kinds of germs in water that can cause eye infections, but a particularly dangerous germ— called Acanthamoeba —is commonly found in tap water (2). This germ can cause a very severe type of eye infection called Acanthamoeba keratitis. 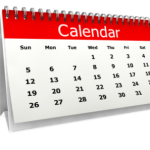 Time is precious but would you use a mouthwash instead of brushing your teeth? Of course not! Rubbing contact lenses in your lens solution and then rinsing is the most effective way of removing deposits before soaking the lenses in your solution. Even though you may have previously seen labels on solution bottles sayng ‘no rub’, these instructions have been proven to be incorrect (3). More than 1 in 10 contact lens wearers fail to close the lid tight on contact lens solutions (4). Keeping the lid on contact lens solutions is important to avoid contamination and maintain the disinfecting power of lens solutions. 30% of contact lens wearers admit to ‘topping-up’ existing solution (soome of the time) in their lens case (4). Why is this a risk? Well, put simply, solutions are made of specific concentrations of chemicals that kill germs. If you dilute the solution it will not kill all harmful germs. Once solution has been used, it no longer has the same strength to kill germs, so when you top-up, you’re essentially diluting the solution and therefore increasing your risk to serious eye infection. 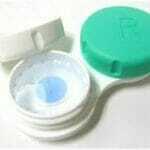 Research surveys (4) show that 66% of contact lens wearers do not look after their lens case in the correct manner. So what should be done? 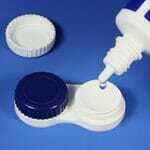 Firstly, clean the case with your contact lens solution and let it air dry. Secondly, when you fill the case with solution, fill it up to the correct point (there is a line indicating the solution level). Thirdly, close the lid of the case completely when your lenses are stored overnight. Finally, replace the case at least every 3 months. time, tiny deposits are formed on the lens surface, which can reduce comfort and vision. The replacement frequency of lenses is determined according to your wearing time, comfort and most importantly suitability for your eyes. Over wearing lenses can therefore adversely affect your vision and eye health. Sleeping & Swimming in lenses? Sleeping in contact lenses increases the risk of microbial keratitis and other complications. Research has shown that the relative risk of so-called corneal infiltrative events increases by 7.1 times (5). We don’t advocate sleeping in lenses unless you have specifically been placed on a continuous lens wear plan and the risks have clearly been explained. Swimming (like tap water) also significantly increases the risk of serious infection from an organism called Acanthameoba keratitis (6). If you want to swim in contact lenses, wear swimming goggles and don’t go underwater. 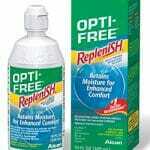 Temptations to swap contact lens solution with bulk buys and special offers on contact lens solutions are everywhere. However, different lens and solution combinations have been shown to result in different levels of comfort. Always use the solution recommended by your Optometrist as it will have been carefully chosen to complement your eyes and contact lenses. There three questions every contact lens wearer ask themselves before applying contact lenses. Ask yourself, do your eyes FEEL good? If you’re experiencing any discomfort or pain, don’t wear contact lenses. Do your eyes LOOK good? If your eyes appear red or swollen, don’t wear contact lenses. Can you SEE normally? If your vision is hazy or if your vision has deteriorated over the last few days, don’t wear contact lenses. 1. Dumbleton KA, Spafford MM, Sivak A, Jones LW. Exploring compliance: a mixed-methods study of contact lens wearer perspectives. Optom Vis Sci. 2013 Aug;90(8):898-908. 2. Visvesvara GS, Moura H, Schuster FL. Pathogenic and opportunistic free-living amoebae: Acanthamoeba spp., Balamuthia mandrillaris, Naegleria fowleri, and Sappinia diploidea. FEMS Immunol Med Microbiol. 2007;50(1):1-26. 3. Zhu H, Bandara MB, Vijay AK, Masoudi S, Wu D, Willcox MD. Importance of rub and rinse in use of multipurpose contact lens solution. Optom Vis Sci. 2011 Aug;88(8):967-72. 5. Radford CF, Minassian DC, Dart JKG. Acanthamoeba keratitis in England and Wales: incidence, outcome, and risk factors. Br J Ophthalmol 2002;86:536-542. 6. Morgan PB, Efron N, Brennnan NA, Hill EA. Risk Factors for the Development of Corneal Infiltrative Events Associated with Contact Lens WearIOVS, 2005, Vol.46, 3136-3143. Research shows that more than half of contact lens wearers don’t wash their hands before applying contact lenses and that 14% of wearers admit to using tap water or saliva to clean their lenses!